Srikanth Bolla (pictured below) is standing tall living by his conviction that if the "world looks at me and says, 'Srikanth, you can do nothing,' I look back at the world and say 'I can do anything'." He is a "useless" baby without eyes… being born blind is a sin, others added. Twenty-three years later, Srikanth Bolla is standing tall living by his conviction that if the "world looks at me and says, 'Srikanth, you can do nothing,' I look back at the world and say 'I can do anything'." He considers himself the luckiest man alive, not because he is now a millionaire, but because his uneducated parents, who earned Rs 20,000 a year, did not heed any of the 'advice' they received and raised him with love and affection. "They are the richest people I know," says Srikanth. 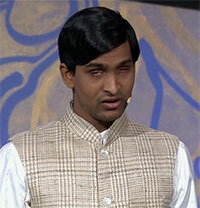 What is it about stories like Srikanth's that so inspire and fill one with hope? Could it be the multiple zeroes after a dollar sign or the belief that you and I can achieve similar success if we set our minds and hearts to it? Underdog success stories touch a raw nerve. After all, everyone faces adversity, they dream, and they work hard. It is another matter that only a few cross the threshold of limits set by society. In Srikanth's case, it is his sheer tenacity that shines through the dark clouds of his misfortune. Being born blind was just one part of the story. He was also born poor. And you know what that means in a society like ours. In school, he was pushed to the back bench and not allowed to play. The little village school had no way of knowing what inclusion meant. When he wanted to take up science after his class X, he was denied the option because of his disability. 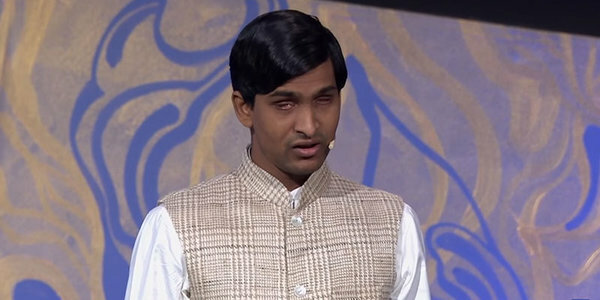 All of 18, Srikanth not only fought the system but went on to become the first international blind student to be admitted to the prestigious Massachusetts Institute of Technology (MIT) in the US. As author Paulo Coelho says, "We warriors of light must be prepared to have patience in difficult times and to know the Universe is conspiring in our favour, even though we may not understand how." operated, is coming up in Sri City, an integrated business city in Andhra Pradesh, 55 kms from Chennai. Angel investor Ravi Mantha, who met Srikanth about two years ago, was so impressed with his business acumen and vision for his company that he not only decided to mentor him but also invested in Srikanth's company. "It was a small, tin-roof shack in an industrial area near Hyderabad. There were eight employees and three machines under the shed. I expected him to talk about how he wanted to make a social impact, but was surprised by the business clarity and technical knowhow in someone so young," Ravi says. They are raising $2-million (around Rs 13 crores) in funding and have already raised Rs 9 crores. According to Ravi, his personal goal is to "take the company to IPO." A vision to build a sustainable company with a workforce comprising 70 percent people with disability is no mean task. "Srikanth's vision is inbuilt in the company. It is not just a lip service to CSR," adds Ravi. "The isolation of differently-abled people starts at birth," Srikanth said in his first public speech on the INKTalks stage in Mumbai last month. According to him, "Compassion is a way of showing someone to live; to give someone an opportunity to thrive and make them rich. Richness does not come from money, it comes from happiness." When Srikanth was growing up, his father, a farmer, would take him to the fields but the little boy couldn't be of any help. His father then decided that he might as well study. "In my parent's entrepreneurship model, I was a failure. In entrepreneurship, we have a lean business model where we evaluate an enterprise and say how quickly it fails." Since the nearest school in his village was five kilometres away, he had to make his way there mostly on foot. He did this for two years. "No one acknowledged my presence. I was put in the last bench. I could not participate in the PT class. That was the time in my life I thought I was the poorest child in the world. It was not because of lack of money but because of loneliness." When his father realised that the child was not learning anything, he admitted Srikanth to a special needs school in Hyderabad. The boy thrived in the compassion he was shown there. He not only learnt to play chess and cricket but excelled in them. He topped his class, even embracing an opportunity to work with late President Dr APJ Abdul Kalam in the Lead India project. But none of this mattered much because Srikanth was denied admission to the science stream in class XI. He cleared the Andhra Pradesh class X state board exams with over 90 percent marks, but the board said he could only take Arts subjects after that. "Was it because I was born blind? No. I was made blind by the perceptions of the people." Having been denied the opportunity, Srikanth decided to fight for it. "I sued the government and fought for six months. In the end, I got a government order that said I could take the science subjects but at my 'own risk'. " Thus not 'risking' anything to chance, Srikanth did whatever he could to prove them wrong. He got all the textbooks converted to audio books, worked day and night to complete the course and managed to secure 98 percent in the XII board exams. Sometimes, life mimics a steeplechase. Especially when it comes to those it has big plans for. It did not give Srikanth enough time to bask in his victory when it threw another spanner in the works. He applied for IIT, BITSPilani, and other top engineering colleges, but did not get a hall ticket. Instead, "I got a letter saying 'you are blind, hence you are not allowed to apply for competitive exams.' If IIT did not want me, I did not want IIT either. How long can you fight?" He chose his battles carefully and did his homework searching the Internet to find the best engineering programme for someone like himself. He applied to schools in the US and got into the top four -- MIT, Stanford, Berkeley, and Carnegie Mellon. He went to MIT (with a scholarship) as the first international blind student in the school's history. It wasn't easy adjusting to life there, but by and by he started to do well. Towards the end of his bachelor's course when the 'what next' question came up, it brought him back to where he had started. "Many questions bothered me. Why should a disabled child be pushed to the back row in the class? Why should the 10 percent of the disabled population of India be left out of the Indian economy? Why can't they make a living like everyone else with dignity?" He decided to give up the 'golden' opportunity in corporate America and came back to India in search of answers to his questions. He set up a support service platform to rehabilitate, nurture and integrate differently-abled people in society. "We helped about 3000 students in acquiring an education and vocational rehabilitation. But then I thought what about their employment? So I built this company and now employ 150 differently-abled people." Entrepreneur bravehearts like the warriors of Paulo Coelho always find one unflinching support, an anchor to keep them afloat. In Srikanth's case, it is his co-founder Swarnalatha. "She was his special needs teacher in school. She has been his mentor and guide through all these years. She trains all the employees with disabilities at Bollant thereby creating a strong community where they feel valued," says Ravi, adding, "Srikanth is a true source of my inspiration. He is not only my young friend and protégé but is also my mentor who teaches me daily that anything is possible if you set your mind to it." The boy who was born blind is today showing many the path to real happiness. He says his three most important life lessons are: "Show compassion and make people rich. Include people in your life and remove loneliness, and lastly, do something good; it will come back to you."